Although MTV stopped showing music videos long ago, the power of music videos to promote artists and brand integration inside music video is proving more powerful than ever. Thanks to the ubiquity of smartphones and sites like YouTube, Vimeo and Vevo, a music video can be shared easily and could quickly go viral. A well-placed product in a video will be seen by more people on YouTube than MTV ever could because a consumer actively chooses to play and watch the video, compared to a block of videos on MTV where a consumer could be passively watching the television while doing something else. From the 2014 Billboard Top 100, 39 music videos featured at least one brand integration, with many featuring multiple brand integrations. Beats pill speakers and headphones were on display in the video for Jessie J’s Bang Bang (viewed over 614 million times), featuring Ariana Grande and Nicki Minaj. Jason Derulo’s Wiggle video (viewed over 710 million times) features the Beats app on a Samsung Galaxy phone. Modatoi and No Publik also made appearances in the video. Not to be outdone, Nicki Minaj featured a half dozen brands in her video for Anaconda, which has been viewed 566 million times. Beats pill speakers, Matefit, Myx, Air Jordan, Victoria’s Secret, and Christian Louboutin all jostled for attention in that video. 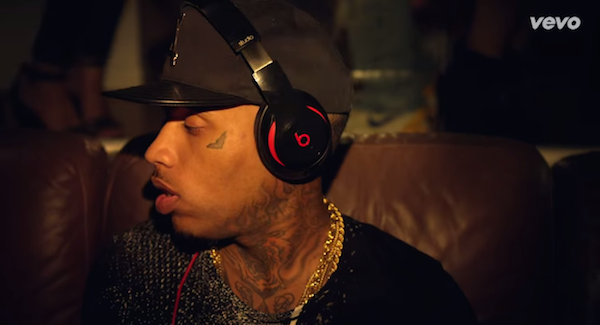 The executives at Beats were savvy enough to present recording artists casually using their products in music videos. The artists add a cool legitimacy to the Beats accessories appearing in music videos while the product is germane to the lifestyle of the artists, as opposed to David Guetta using Quicken on his phone while chillin’ at the club, for example. Because of it’s dynamic campaigns and partnerships with the most popular musicians and athletes working today, Beats was the most prominent brand integration in music videos in 2014. Products from Beats (Beats pill speakers, Beats by Dre headphones, and the Beats Music app) appeared in more than 18 of the 2014 Billboard Top 100. We did the math, and added up the total music video hits with brand integration from Beats: 4 billion views and counting. That’s a ton of brand recognition and ultimately a lot of product sales for the headphones giant. With that level of quality brand integration, it’s no wonder Apple bought Beats by Dre for $3.2 billion.